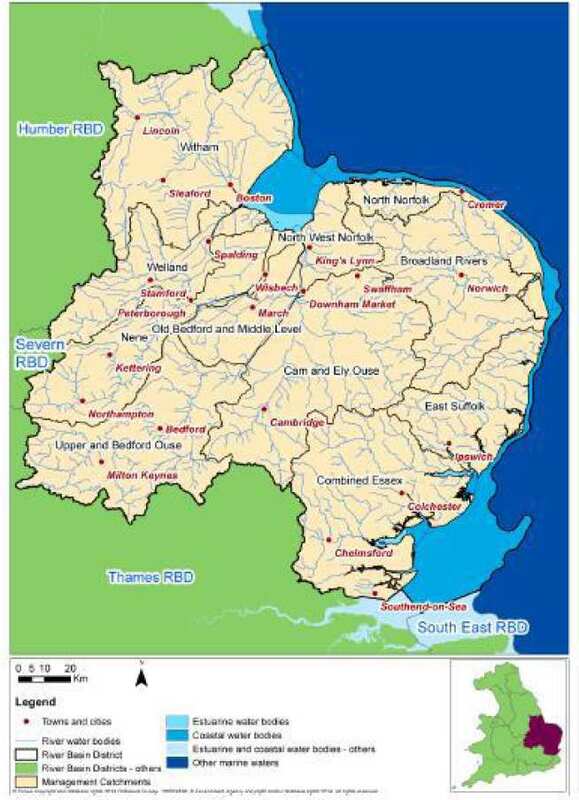 The Anglian case study is a river basin district located in the east of England. This region is extremely dry, receiving only two thirds of the UK’s average annual rainfall (600 mm per year). The Anglian region is mostly low lying, with fens (artificially drained coastal and estuarine wetlands) comprising a large proportion of the area. This results in over one fifth of the area being susceptible to coastal and surface flooding. The area is one of the world’s most productive agricultural landscapes. Horticulture and pig and poultry farming are also important. Construction is the largest economic sector in the basin, with manufacturing also an important sector. Additionally, the area is the richest in the UK for wetland wildlife with 23 Special Areas of Conservation (SACs) and 22 Special Protection Areas (SPAs). Within the region approximately 60% of freshwater abstraction is from surface water and 40% from groundwater. The area is classified as seriously water stressed, with 20%-45% of the effective rainfall abstracted. The effects of water abstraction are exacerbated by a rapidly growing population. Since the 1990s there have been 5 periods of drought officially declared in the region. The Broads catchment will be used for detailed study and analysis. This area covers 3,188 km2 and includes the Broads Executive area which, due to its high density of protected sites, has the equivalent management status to a national park. The catchment is extensively monitored: climatic data since 1914, priority substances and specific pollutants, and biological records since 1980. There is considerable background knowledge and information in this basin that can be used to undertake a comprehensive study. to assess change scenarios in the water resources ecosystem services and the effects in socio-economic development.